Considering how the internet has normalized geekdom (i.e “nerd is the new cool”), it’s surprising that cinema hasn’t really caught up. On screen, geeks are stereotypes—jocks still push bespectacled math-lovers into lockers. And, even when nerdy things aren’t being ridiculed on camera, their portrayal is often heightened or broadly comedic. 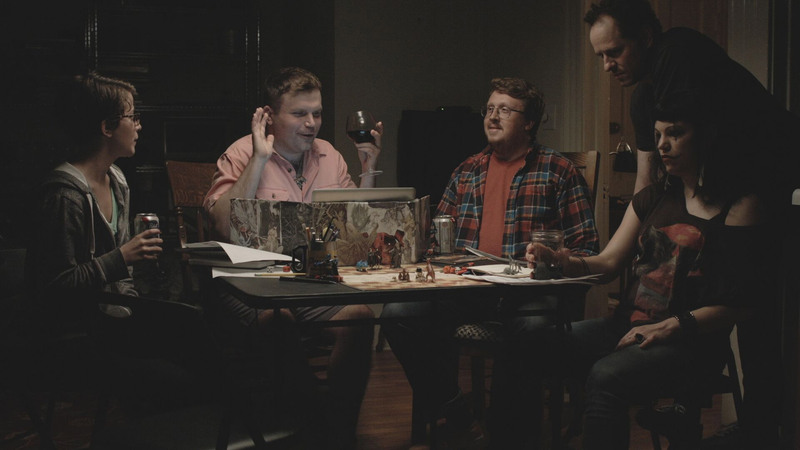 Standing in contrast to this, Sadie Rogers’s RPG feels surprisingly innovative—a low key, character-driven short about a group of people playing Dungeons and Dragons. Here, nothing is handled in an over-the-top way—the characters are nerdy, but not in the “asthma-inhaling” kind of way. Rather, they feel like “real” people. Their camaraderie and interactions come off as genuine, a group of friends with interconnected relationships and histories that this 12-minute piece only begins to explore. Admittedly, this isn’t a film for everyone—it’s slowly paced and it lacks resolution (personally, I would have liked the conclusion to have more impact). But, still, I couldn’t help but being engaged by the journey. Maybe it’s because I’m a bit of a board game junky (I never played D&D, but I’ve wasted too many hours on Catan and Dominion), but this short’s depiction of friendship really spoke to me. How can you spend hours of time with a group of people, but not actually confront how you really feel? Often, it’s easier to just play a character—something this group literally does every week. It’s a simple, subtle metaphor that Rogers never overplays as a director. Do I wish things went further in terms of narrative? Yes. But, I admire the restraint it takes to make a film such as this. Now that RPG has finished its festival run, Rogers is already hard at work on other projects. She’s in post production on a sci-fi short entitled Chip V.2. She’s also writing another short and working towards her first low-budget feature.